Adolescent Idiopathic Scoliosis (AIS) is an abnormal curvature of the spine exceeding 10 degrees, diagnosed in adolescence and in which the cause is unknown. The deformity occurs with rotational misalignment, often marked by a hump in the ribs or low back, as well as loss of the normal sagittal curves of the spine. • Adolescent: The diagnosis is made in adolescence. • Idiopathic: The reason for the scoliosis has not yet been determined. The term “Idiopathic” comes from Greek and literally translated would mean “one’s own private suffering”. A case will be labeled “idiopathic” if there are no obvious neuromuscular diseases, genetic syndromes or congenital malformations. In practice, AIS is used as a final diagnosis for adolescent scoliosis with a specific, recognizable pattern of symptoms. Rather than as an admission we don’t have a diagnosis yet, AIS is being treated as the diagnosis. When one receives the diagnosis of AIS, it should mean that the doctors have more work to do in an effort to understand the cause of the curve. That being said, the types of cases that end up in the AIS category do present with characteristic syndrome features. So, what is the AIS syndrome? – No Genetic syndromes such as Marfan’s, Ehlers-Danlos, or any other known syndrome which is associated with scoliosis. AIS cases are otherwise healthy kids, with a progressive scoliosis of unknown cause. • Rapid worsening stops with skeletal maturity. As growth slows to a stop, rapid worsening of the scoliosis comes to an end. From that point, as the child enters adulthood, AIS may or may not progress slowly over the decades.8 This may depend on variables such as the size of the curve, the location of the curve, and the postural balance of the spine. – Rib Hump. Often the rib hump is first only observed when performing the Adam’s Forward Bending Test, and it will disappear upon returning to the upright posture. Over time, rib humps transition from being present only when bending forward to being present when standing upright. – Flat Back. A flattening of the thoracic spine’s normal kyphotic curve will often precede any scoliosis bending or twisting. It has been observed to be one of the first structural changes of scoliosis. – Rib hump and flat back? This may seem contradictory, yet the occurrence of both these phenomenon reveal great insight as to the probable cause of AIS. Both of these changes allow for a shortening of the overall length of the spinal canal, which houses the spinal cord. – The Spinal Cord is the Center of the Twist. The spine coils-down around the axis of the spinal cord. – Structural changes in the soft tissue and bone. Bones, ligaments, muscles, and discs will change shape to accommodate the coiled-down posture of the spine. This change in shape happens gradually as the curves persist during growth, and can become quite rigid as scoliosis matures. • Skinny, tall and flexible females. AIS tends to be more common in females with low body mass11 and hyper-mobile joints12. Female dancers and gymnasts seem to have a higher prevalence of scoliosis as they fit this stereotype. However, there are also a fair share of normal and overweight females of average height with the condition. – AIS is Non-responsive to traditional physical therapy and chiropractic treatment13. – Bracing is the only non-surgical treatment shown to significantly reduce the risk of progression in high-risk case types (curves 25 + degrees, skeletally immature)14. – Scoliosis-specific exercises may help, though not without being used in combination with a brace. – Surgery is the primary treatment option if curve exceeds (or threatens to exceed) 40-50 degrees. • Tight spinal cord: Most AIS cases have a short, tight neural tissue within the spinal canal, such as a tight spinal cord or cauda equina. When surgically correcting Adolescent Idiopathic Scoliosis, the short, tight spinal cord is what limits how straight the spine can be made. The surgeon can remove all other hindrances to a straight spine, cutting out bone and soft-tissue contractures that bind the spine, however, one should not cut the tight spinal cord, for obvious reasons. What Causes Adolescent Idiopathic Scoliosis? All the structural changes that take place as a normal spine transitions into AIS can be explained by a tight spinal cord. More accurately, tension anywhere along the spinal canal, also called the neural axis, can explain all the changes we see in the alignment of the spine. The official name for this hypothesis first put forward by Dr. Roth is “Asynchronous Neuro-Osseous Development“28,29. The theory states that as the child’s bones grow rapidly, the nervous system or spinal cord is unable to keep up the pace. This results in tension along the axis of the spinal canal, which is relieved by the scoliotic posture. • Adam’s test is a nerve tension test. The scoliosis screening test known as Adam’s forward bending test, is a nerve tension test. The forward bending posture of Adam’s test results in an elongation and stretch of the spinal canal. Nerve tension increases in this forward bent position, and to relieve that tension the spine twists and collapses down like a spring. This twisting is evidenced by the rib hump which appears when the child bends forward. • “Flat Back” relieves the tight spinal cord tension. The Flat Back posture which precedes the onset of severe scoliosis is explained by nerve tension. Flat back posture is simply the opposite of the forward bent posture. Since the Adam’s forward bending Test increases stretch on the spinal cord, the flat back posture shortens the spinal canal, relieving nerve tension. • Scoliosis itself is a posture that shortens the spinal canal, relieving nerve tension. • Worsening with growth. Asynchronous growth between the spinal cord and the bones. 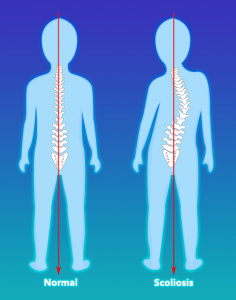 It is common sense that during growth spurts the bones are growing tall at a fast rate. If the spinal cord is unable to keep up with this growth, a continual increase in nerve tension will occur. More rapid growth means a more rapid increase in nerve tension. Since scoliosis is a posture that shortens the spinal canal and relieves nerve tension, rapid growth results in rapid worsening and collapse of the scoliosis. “Adolescent Idiopathic Scoliosis” should be a term reserved for a scoliosis curve that is still awaiting a diagnosis. Clearly, it is not being used that way. Rather, the term is being used as a diagnosis of a syndrome with the above features. A preponderance of evidence points to a tight spinal cord as a probable cause for many cases. So, if you or your child are told they have Adolescent Idiopathic Scoliosis, remember this: It happens for a reason, its causes are knowable, and the condition can be successfully treated without surgery. For more information on how AIS can be treated successfully without surgery, visit our scoliosis treatment page. Burwell RG, Dangerfield PH, Moulton A, Grivas TB, Cheng JC. Whither the etiopathogenesis (and scoliogeny) of adolescent idiopathic scoliosis? Incorporating presentations on scoliogeny at the 2012 IRSSD and SRS meetings. Scoliosis 2013;8:4. Byun S, Han D. The effect of chiropractic techniques on the Cobb angle in idiopathic scoliosis arising in adolescence. J Phys Ther Sci 2016;28:1106–10. Cakrt O, Slaby K, Viktorinova L, Kolar P, Jerabek J. Subjective visual vertical in patients with idiopatic scoliosis. J Vestib Res 2011;21:161–5. Antoniadou N, Hatzitaki V, Stavridis SΙ, Samoladas E. Verticality perception reveals a vestibular deficit in adolescents with idiopathic scoliosis. Exp Brain Res 2018. Cheung JPY, Cheung PWH, Samartzis D, Luk KD-K. Curve Progression in Adolescent Idiopathic Scoliosis Does Not Match Skeletal Growth. Clinical Orthopaedics and Related Research 2018;476:429–36. Agabegi SS, Kazemi N, Sturm PF, Mehlman CT. Natural History of Adolescent Idiopathic Scoliosis in Skeletally Mature Patients: A Critical Review. J Am Acad Orthop Surg 2015;23:714–23. Bunnell WP. An objective criterion for scoliosis screening. J Bone Joint Surg Am 1984;66:1381–7. Coelho DM, Bonagamba GH, Oliveira AS. Scoliometer measurements of patients with idiopathic scoliosis. Braz J Phys Ther 2013;17:179–84. Liu Z, Tam EMS, Sun G-Q, et al. Abnormal leptin bioavailability in adolescent idiopathic scoliosis: an important new finding. Spine (Phila Pa 1976) 2012;37:599–604. Arponen H, Mäkitie O, Waltimo-Sirén J. Association between joint hypermobility, scoliosis, and cranial base anomalies in paediatric Osteogenesis imperfecta patients: a retrospective cross-sectional study. BMC Musculoskelet Disord 2014;15. Lantz CA, Chen J. Effect of chiropractic intervention on small scoliotic curves in younger subjects: a time-series cohort design. J Manipulative Physiol Ther 2001;24:385–93. Bettany-Saltikov J, Turnbull D, Ng SY, Webb R. Management of Spinal Deformities and Evidence of Treatment Effectiveness. Open Orthop J 2017;11:1521–47. Kwan KYH, Cheng ACS, Koh HY, Chiu AYY, Cheung KMC. Effectiveness of Schroth exercises during bracing in adolescent idiopathic scoliosis, Results from a preliminary study-SOSORT Award 2017 Winner. Scoliosis Spinal Disord 2017;12:32. Moramarco M, Moramarco K, Fadzan M. Cobb Angle Reduction in a Nearly Skeletally Mature Adolescent (Risser 4) After Pattern-Specific Scoliosis Rehabilitation (PSSR). Open Orthop J 2017;11:1490–9. Shokei Yamada, MD, PhD, FACS. Tethered Cord Syndrome. https://rarediseases.org/rare-diseases/tethered-cord-syndrome/. Romano M, Negrini A, Parzini S, et al. SEAS (Scientific Exercises Approach to Scoliosis): a modern and effective evidence based approach to physiotherapic specific scoliosis exercises. Scoliosis 2015;10. Pastorelli F, Di Silvestre M, Plasmati R, et al. The prevention of neural complications in the surgical treatment of scoliosis: the role of the neurophysiological intraoperative monitoring. Eur Spine J 2011;20 Suppl 1:S105-14. Mineiro J, Weinstein SL. Delayed postoperative paraparesis in scoliosis surgery. A case report. Spine (Phila Pa 1976) 1997;22:1668–72. Chu WC, Lam WM, Ng BK, et al. Relative shortening and functional tethering of spinal cord in adolescent scoliosis – Result of asynchronous neuro-osseous growth, summary of an electronic focus group debate of the IBSE. Scoliosis 2008;3:8. Chu WCW, Deng M, Hui SCN, et al. Spinal cord morphology predicts curve progression in adolescent idiopathic scoliosis treated with bracing?, A prospective cohort study with magnetic resonance imaging. Scoliosis 2015;10. Porter RW. The pathogenesis of idiopathic scoliosis: uncoupled neuro-osseous growth?, Uncoupled neuro-osseous growth? Eur Spine J 2001;10:473–81. Porter RW. Can a short spinal cord produce scoliosis? Eur Spine J 2001;10:2–9.